Queen were my first love musically and I still remember clearly where I was when I heard Freddie Mercury had passed away. I, like most of the world, sat by the TV to watch the all star tribute concert which was performed on 20 April, 1992. I remembered a great deal about it, but being only 14 at the time, I was unfamiliar with a lot of the acts on the stage. It seems ridiculous now looking back, but being so young and fixated on Queen, the likes of Tony Iommi, Metallica and Slash were virtual unknowns to me at the time. With the release of the concert as a 3 DVD set, I was very much looking forward to seeing it again. In terms of star power and scale, only Live Aid could top this extravaganza. However, where Live Aid was staged in two venues with a massively eclectic selection of artists, this show was all about the life and work of Freddie. With 72,000 people packing out Wembley and a further billion watching at home, it was a massive event. Disk one encompasses the opening acts, where many of the guests performed their own songs as well as throwing in a few Queen numbers. Metallica kick things off with 'Enter Sandman' and follow up with equally strong renditions of 'Sad But True' and 'Nothing Else Matters'. Extreme gave a great performance with a Queen medley, Gary Cherone doing a terrific job – far better than his stint with Van Halen! Def Leppard are joined by Brian May for 'Now I'm Here', Bob Geldof performs 'Too Late God' (and fortunately does not attempt any Queen songs) and Guns N' Roses close the first part with noisy renditions of 'Paradise City' and 'Knocking On Heaven's Door'. Don't mistake the fact that there are three disks to mean this is the entire show however. Many songs were trimmed from the original VHS release because of time restrictions, and the DVD fails to restore many of them. Def Leppard's set loses 'Animal' and 'Let's Get Rocked', Extreme's version of 'More Than Words' is gone and Spinal Tap's appearance is completely omitted. The satellite performance from U2 is also absent. 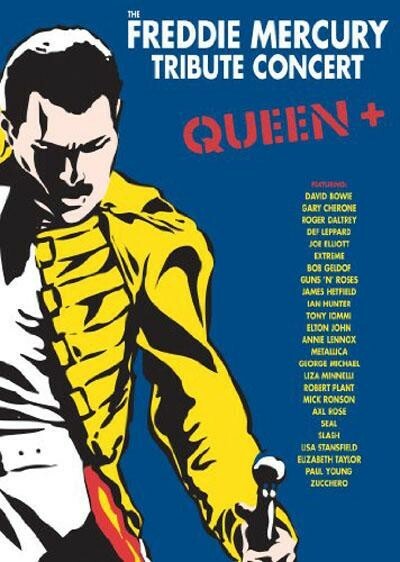 Disk two is the main show, billed as 'Queen +', where the band are joined by guests. Joe Elliot and Brian May perform a decent 'Tie Your Mother Down' to kick things off, while Tony Iommi plays rhythm guitar, a role he retains for most of the show. I suspect some digital touch ups have been added, as I'm sure Roger Daltrey hit a howling bum note in an otherwise strong rendition of 'I Want It All', but there is no sign of it here. Respect must go to Zucchero for picking a lesser known Queen track with 'Las Palabras De Amor' and making a pretty decent fist of such a great ballad. Gary Cheorne does a good job of 'Hammer To Fall' while James Hetfield blasts through 'Stone Cold Crazy'. Robert Plant's rendition of 'Innuendo' is absent but his rendition of 'Crazy Little Thing Called Love' is fun. Brian May debuted 'Too Much Love Will Kill You' here, before Paul Young enters the fray for 'Radio Ga Ga'. Bizarrely, I remembered he did a good job while Seal's version of 'Who Wants To Live Forever' was flat and lifeless, yet watching it here it would seem the opposite is true. Lisa Stansfield is one of the standout performers with a strong performance of 'I Want To Break Free', while Annie Lennox and David Bowie perform 'Under Pressure'. Bowie stays on stage to be joined by Mick Ronson and Ian Hunter for 'All The Young Dudes' before George Michael takes the mantle of best performance with a stirring 'Somebody To Love'. Elton John handles 'Bohemian Rhapsody' (with help from a rasping Axl Rose) and delivers 'The Show Must Go On' extremely well, before Liza Minelli closes the concert with 'We Are The Champions'. It's an enjoyable show, and this set is rounded out by a third disk which features a documentary about how the concert was put together, including interview snippets from just about every star on the bill, as well as comments from Brian May and Roger Taylor. There is also fascinating rehearsal footage, and it's amazing to see so many stars in one place, patiently sat waiting and watching for their turn. It's particularly nice to see the likes of Extreme and George Michael singing along to songs other artists are performing. It's a pity the missing songs couldn't have been restored, but regardless, it's a great set well worth owning. The list of artists is staggering, yet as Robert Plant points out, despite key changes in some tracks, none of the singers could top the original versions – a testament to just how special Freddie Mercury was. This was a fitting send off.